Visits Revival Centre in Chernihev Ukraine. Ukraine President Victor Yuschenko presents Natalia Pasichnyk Zenchenko special service award in Kiev on January 13, 2010. She is one of the founders of the "Revival" Centre of Rehabilitation that LifeNets helped with startup in 1996. 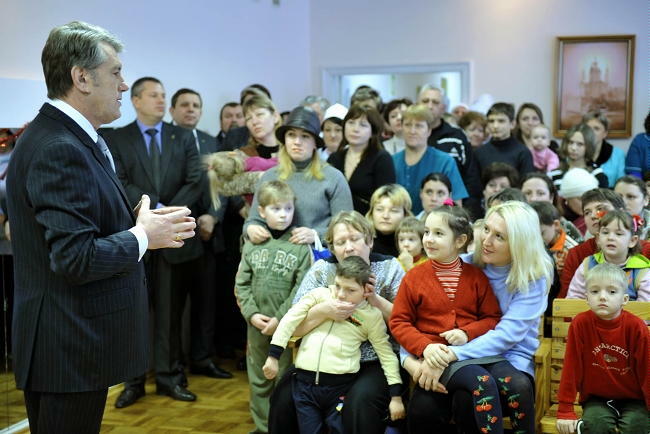 On January 11, 2010, near the end of his term, the President of Ukraine, Victor Yuschenko, visited the Revival Centre of Rehabilitation in Chernihev, Ukraine. LifeNets has been on the ground floor of this wonderful Center for disabled children. We've been working with the founding doctors since 1996. Our work there has opened the doors to everything else that we've done with LifeNets. Our history can be found at www.lifenets.org/chernobyl. While he was giving a tour to the President, in the choreographic wing of the Centre, Dr. Pasichnyk pointed out the plaque on the wall showing the names of the LifeNets donors who contributed to the construction of this wing. The President in a very pleasant way acknowledged the work of LifeNets with the Rehabilitation Center. 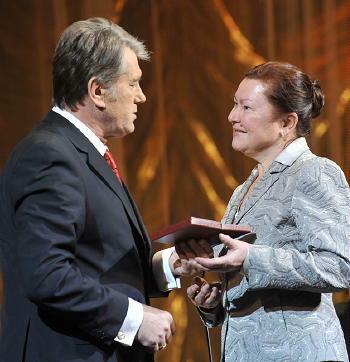 On January 13, the President invited Dr. Pasichnkyk's wife Natalya to Kiev to present with her with a special service award for her efforts as a neurologist and a founder of the "Revival Center."